Be the first to share your favorite memory, photo or story of Marie. This memorial page is dedicated for family, friends and future generations to celebrate the life of their loved one. 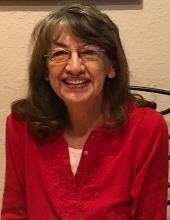 Marie Yolanda Anthony-Peters Melcer, 77, passed away peacefully in her sleep, Tuesday, March 26, 2019. She was born in Nogales, Arizona on October 24,1941 to Joseph Grijalva Peters and Marina Ortiz Peters. She graduated from Nogales High School in Nogales, Arizona and also graduated from North Harris County College with a degree in Nursing. Marie enjoyed spending her time with her children and grandchildren, listening to music in which Michael Bublé, Barry Mannilow, The Bee Gee’s were among her favorites. She also liked the color purple, mystery movies, reading books, painting, sewing and crochet. She is preceded in death by her father, Joseph Peters; mother, Marina Peters; sisters, Rachel Anthony-Peters, Marina Federico, Ida Federico, Olivia Rivero; brothers, Hector O. Peters, Rene Peters; grandchildren, Bianca Jade Miller and Ethan Zachary Hoffman. She is survived by her children, Steve Melcer, Sharon Hoffman and husband Henry E. Hoffman Jr and Karen Melcer and her partner Shawn Traylor. Also, grandchildren, Stephen Powley, Shelby Powley, Cherie Miller, Madeleine Miller, Ryan Edgley; great grandchildren, Julian Kohler, Tessa Dillard, sisters Bernadette Garcia, Bernice Peters, and many nieces ,nephews, cousins and friends . Funeral services will be at 2:30 PM in the chapel at McNutt Funeral Home, 1703 Porter Rd., Conroe, Texas 77301. In lieu of flowers please donate to Autism Speaks or His Grace Foundation. To send flowers or a remembrance gift to the family of Marie Yolanda Anthony-Peters Melcer, please visit our Tribute Store. "Email Address" would like to share the life celebration of Marie Yolanda Anthony-Peters Melcer. Click on the "link" to go to share a favorite memory or leave a condolence message for the family.